Who would ever guess how hard it is to find a good piece of brown kraft cardboard (or pad board, or chipboard, or whatever you want to call it)? I spent months earlier this year phoning paper merchants, tapping out desperate emails, feverishly ripping open posted samples, only to be disappointed time & time again. That Goldilocks gal knew what she was talking about...it had to be just right. By right I mean the right colour (more brownish than grey), the right texture (nice & pulpy, but not too coarse) & the right weight (thick enough to hold the weight of a pocket mirror without bending). Are you bored yet? I'll be listing some drink coasters in my Etsy shop next week, & the week after that, some button packs. 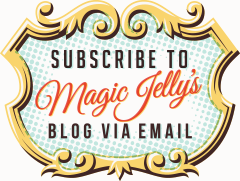 I'll also be announcing my first monthly giveaway in the next few days - only subscribers to my mailing list are eligible, so don't forget to join!